We were greeted to Manpuku by the sight of a blazing fire in the hills near the Getty center and a fresh, dead rat lying on the sidewalk. Nice. A terrific start to my first Japanese BBQ experience. Manpuku is located on Sawtelle near Olympic, in a fantastic enclave of affordable Asian restaurants and more importantlyâ€¦a Yogurtland! I was secretly eager to get the meal over with so we could get on over to Yogurtland. We each ordered a different red meat which would come raw and we would cook it ourselves over the little grill in the center of the table. Some scant veggies were included to grill. 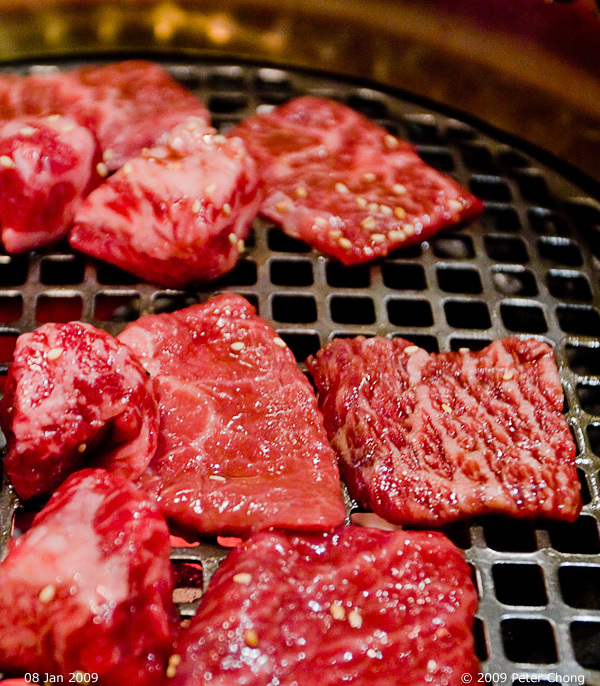 Very similar to Korean BBQ, which I love. And just as tasty. However, not as many sides come with the meat. In fact, you just get a Barbie-sized portion of kimchi. Luckily the lunch special includes rice and miso soup so we were all surprisingly full afterwards. Michael Jackson was playing non stop while we dined, much to Nancyâ€™s delight. Quite full and with no business walking over and pouring a bunch of yogurt on top of everything, we walked over and poured a bunch of yogurt on top of everything. Yeah for us! I think MJ would have approved.